Are you ready to go Deadpool mode? But with this cool looking, Deadpool costume won’t be able to get shot and keep breathing alike real Deadpool. But its breathable mask fabric and connected fabric gloves will help you stay long enough inside it. 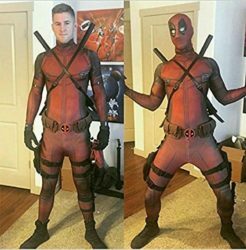 So get ready for the Halloween party with this Deadpool cosplay.